Best Finishes: US Masters Nationals Swim Meet 2012 - 1st Place 200 Free, KC Tri 2011 - 1st AG, USAT All American 2010, 2011 Bike Source Heritage Park Triathlon, 2nd Place OA, KC Tri 2010 - 1st AG, KC Tri 2009 - 1st AG, Ironman Kansas 2009 - 1st AG, Ironman New Orleans 2009 - 1st AG. Day Job: Sales Director at National Registered Agents, Inc.
Best Finishes: Topeka Tinman 2012 - 3rd AG, SMT 2012 - 3rd AG, Kansas City Marathon 2012 - 7th AG, 2012 Gobbler Grind - 3rd AG, 2011 Gobbler Grind - 11th AG, KC 5150 Triathlon 2012 - 22AG, 2011 Ironman 70.3 Miami - 95th AG, 2011 Ironman 70.3 Kansas - 37th AG, Groundhog Run 2012 - 5th AG. 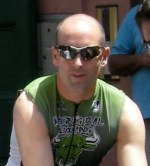 Best Finishes: 2010 Ironman 70.3 World Championship Qualifier and Finisher, 2008 Waddell & Reed Kansas City Half Marathon 3rd Place - Age Group; finisher of 10 Ironman 70.3 races and Ironman Louisville.